To enhance the health and well-being of the members of my community and the environment we live in by building relationships and providing activities and services within walking distance that promote self-understanding, connection, and healthful lifestyle practices. A major cause of disease is stress. Yoga decreases the stress response and stimulates the relaxation response while also increasing strength, flexibility and muscle tone. People who practice yoga enjoy enhanced physical health and a greater sense of well-being. Yoga is low-impact and can be practiced by every body. Sandi Goodwin is registered with the Yoga Alliance as an E-RYT-200 level Yoga Teacher and holds a 300-hour certification in Yoga Therapy from the Rocky Mountain Institute for Yoga and Ayurveda. She is a certified Ayurvedic Health Educator and certified Meditation Teacher as well. 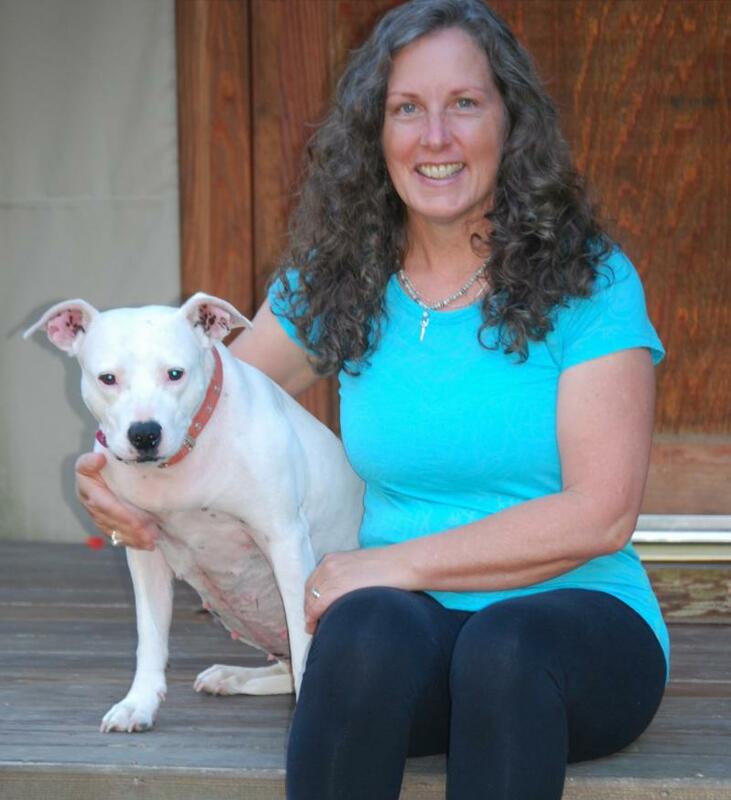 Trained in Ananda Yoga and YogaEd., Sandi continues to train with teachers in a variety of classical traditions. She most recently added Postural Alignment Specialist trained in the Egoscue Method®﻿ to her tool kit. She pulls from all her training to create an eclectic blend that she uses to customize her classes to the needs of her students. She enjoys teaching small groups and individuals in a casual and personal environment. "I meet people where they are and enjoy leading them to their next step." Luna is a white Staffordshire terrior rescue and the Garden Home Yoga greeter and therapy dog. Copyright 2009 Garden Home Yoga and Wellness. All rights reserved.